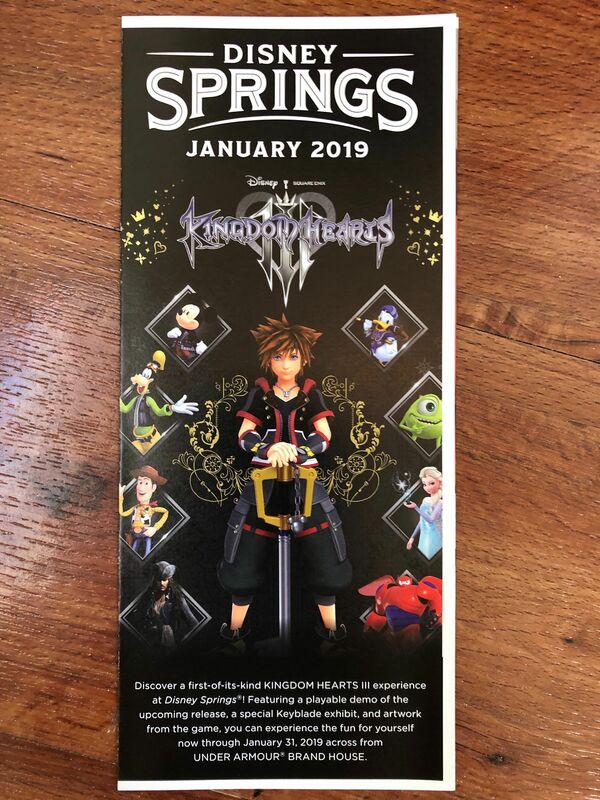 With KINGDOM HEARTS III just around the corner, SQUARE ENIX announced that a limited-time KINGDOM HEARTS III pop-up store would be appearing in Disney Springs at the Walt Disney World Resort. I stopped in last week to play the demo (which turned out to be the same demo as shown at E3 2018, so you can check out my thoughts on it here), check out the merchandise for sale, take photos, and see what it generally was all about. Looking inside from outside while walking past the pop-up store at Disney Springs, you can really see that there is KINGDOM HEARTS III plastered everywhere inside. When you first enter, you sign up for a KINGDOM HEARTS III demo time slot and register your phone number so you can receive a text when your time slot is up. While waiting, SQUARE ENIX set up a lobby area. There is a gorgeously ornate armchair to take photos in, an S-shaped couch to sit and wait on, kiosks to preorder the KINGDOM HEARTS III regular and deluxe editions for PlayStation 4 and Xbox One (via an e-mail that with a link to the SQUARE ENIX store), and television screens that show trailers for the games. You can also peek into the playing area from nearby the arm chair and you can gaze at the art that is on the walls. There are also life-size keyblades from KINGDOM HEARTS III to look at while you’re waiting. These photos don’t do them justice, for the three different keyblades they had on display were truly gorgeous to look at. They had a lot of KINGDOM HEARTS III merchandise for sale that were scattered throughout both the waiting area and the playing area. These included intricate figurines, the KINGDOM HEARTS III games themselves, miniature keyblades, and even an ice cube tray. 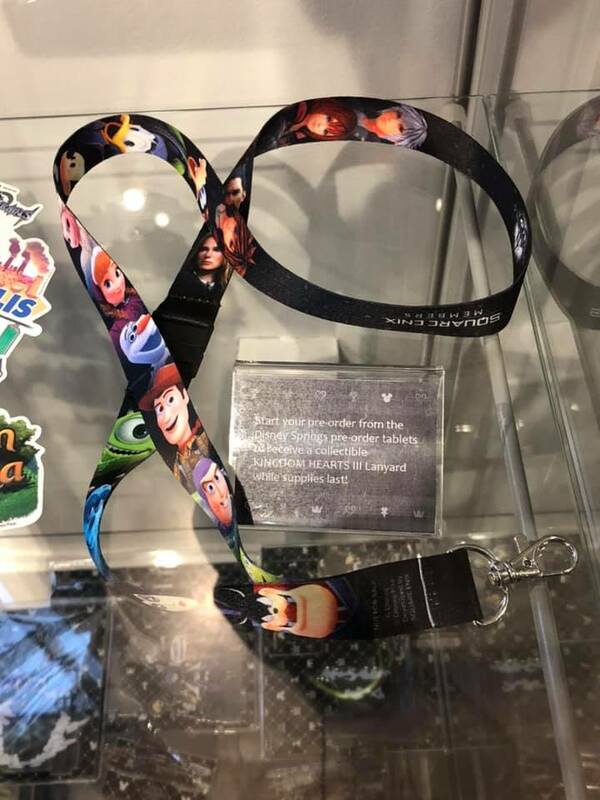 In order to incentivize people to order KINGDOM HEARTS III through the e-mail sent from the kiosks inside the store, SQUARE ENIX offered a KINGDOM HEARTS III lanyard that was exclusive to preorders that were made through the Disney Springs KINGDOM HEARTS III pop-up store. When your number is called, you are asked what platform you want to play it on: Xbox One or PlayStation 4. You are then handed a number card that corresponds to what station you’ll be going to and you get in the queue to go in. Just beyond it, you can see people playing the KINGDOM HEARTS III demo. There are ten stations for each console set up. Once it is your demo time, you find the PlayStation 4 or Xbox One station number that corresponds with your number, and you get twenty minutes to play through one or both of the Toy Story and Hercules KINGDOM HEARTS III demos. I was not allowed to take photos of the gameplay itself, however. The walls were quite decorated as well with KINGDOM HEARTS III. And, of course, there was another KINGDOM HEARTS III pre-order kiosk by the exit. Overall, the KINGDOM HEARTS III pop-up store was a fun experience to visit and enjoy while in Disney Springs. While I did not preorder the game from the store (I already preordered my copy from the SQUARE ENIX store), I saw that there were plenty of people who did during my brief visit. If you haven’t preordered KINGDOM HEARTS III yet, and you can’t make your way to Disney Springs in Florida to order a copy there, then you can still preorder KINGDOM HEARTS III for the PlayStation 4 (Regular & Deluxe Editions) and Xbox One (Regular & Deluxe Editions) now. You can also still order the SQUARE ENIX Store Exclusive Bundle that comes with the KINGDOM HEARTS III Deluxe Edition and three bundle-exclusive BRING ARTS figures of Sora, Donald, and Goofy (PlayStation 4 / Xbox One). It is also not too late to unlock the Starlight Keyblade in KINGDOM HEARTS Union χ[Cross] on iOS and Android platforms. You can check out our guide to completing all the Classic Kingdom Minigames here, so you’ll have your own code ready for KINGDOM HEARTS III launch day! Finally, check out my opinion piece on why SQUARE ENIX’s decision to lock away the epilogue and secret movie of KINGDOM HEARTS III as a downloadable is a good thing if you need something to do while waiting for KINGDOM HEARTS III to be released tomorrow, January 29, 2019. Have you preordered KINGDOM HEARTS III yet? Have you visited the KINGDOM HEARTS III pop-up store in Disney Springs?